Sometimes your bear gun needs to become a mouse gun for the barn or a snake charmer on the trail. 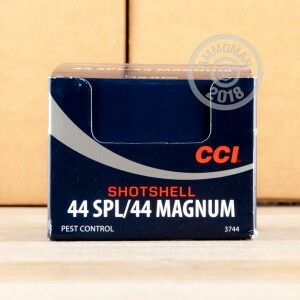 These shotshells from CCI fit cleanly into the cylinder of your favorite revolver chambered in either .44 Special or .44 Remington Magnum. 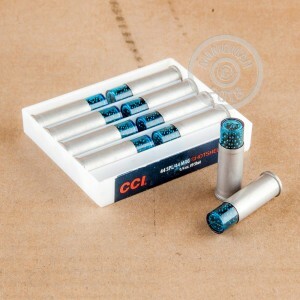 Each cartridge uses a non-reloadable aluminum casing fitted with a clean-igniting Boxer primer. In lieu of a bullet, this type of round contains a plastic capsule with #9 shot pellets inside. When fired, the capsule is shredded and broken upon contact with rifling which frees the shot and allows to it to maintain a usable pattern at close ranges. The pattern can be attributed to a flexible wad which expands in order to capture propellant gases that might otherwise bleed into the shot cloud and cause it to disperse. This performance is ideal for increasing your hit probability when keeping venomous snakes away from your children, pets, and livestock. While the capsule does leave behind some residue, it is easily cleaned out with traditional methods. Each ten-round case can be reused or kept for longterm storage away from other ammunition. 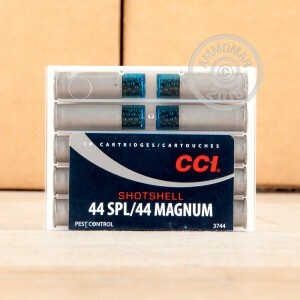 This cartridge's bright aluminum casing and blue translucent capsule make it instantly recognizable as a shot round so that it's not confused with your regular hunting, plinking, and personal-defense .44 magnum ammo.